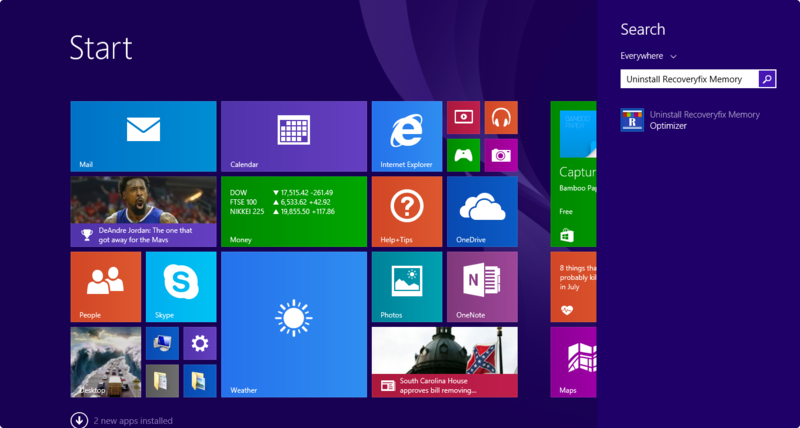 The software dashboard shows the current system performance. Preview of current system process that are running on CPU. Facility to configure optimizer settings. Q. How the Recoveryfix Memory Optimizer software increases the performance of computer? A. Recoveryfix Memory Optimizer increases RAM speed of your computer system by freeing up the physical memory that gets burdened up with extra traces of applications, programs, etc. 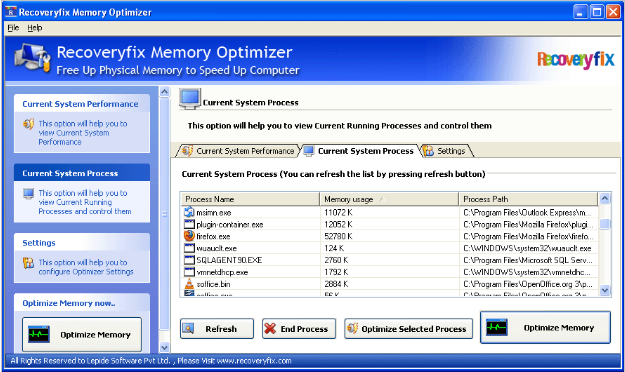 Recoveryfix Memory Optimizer also looks after the running CPU processes, thereby increasing the computer system speed. With Recoveryfix Memory Optimizer, you can increase 80% of the computer memory speed. Q. 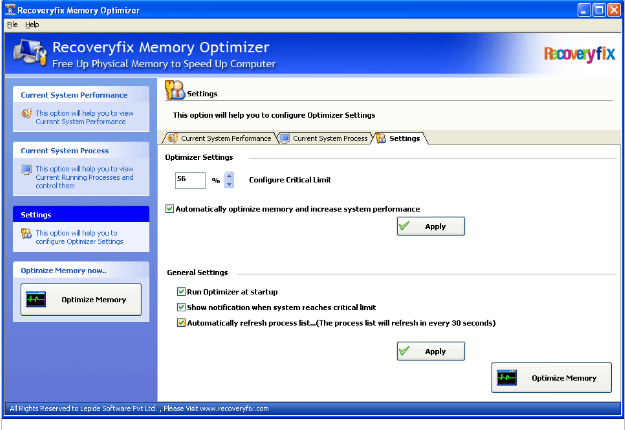 What are the key features of Recoveryfix Memory Optimizer? Facilitates the termination of any current running system process. Q. 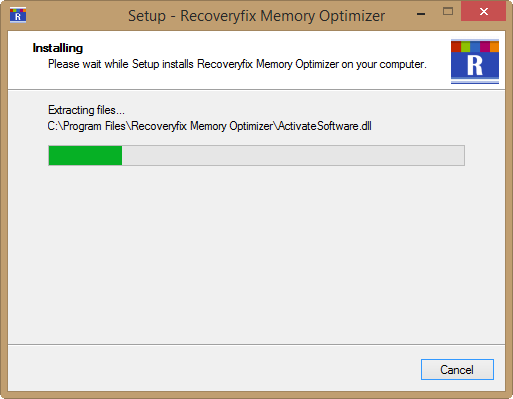 What is the difference between Trial and Full version of Recoveryfix Memory Optimizer? A. The trial version of the software can be downloaded for free which works effectively for 30 days. After 30 days, the software expires and you need to purchase full version of the software to have uninterrupted RAM memory optimization. Whereas on the other hand, the full version of Recoveryfix Memory Optimizer works without limitation throughout the lifetime. Q. 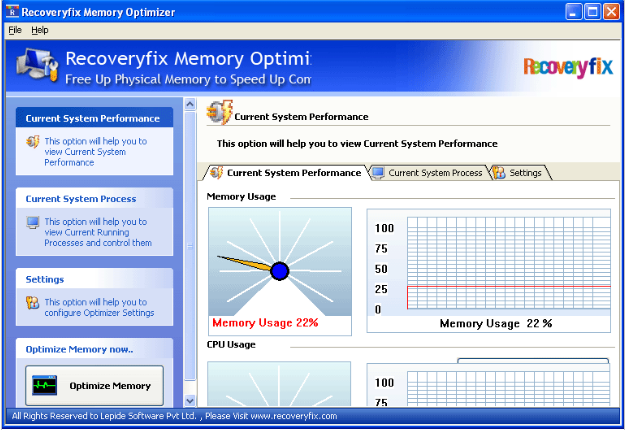 Do you provide support for Recoveryfix Memory Optimizer Software? Q. 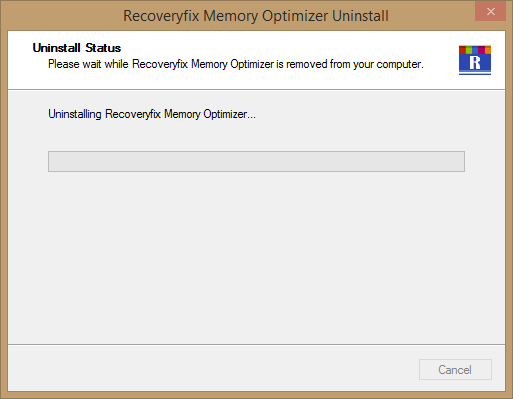 Does the Recoveryfix Memory Optimizer performs automatic memory optimization? A. 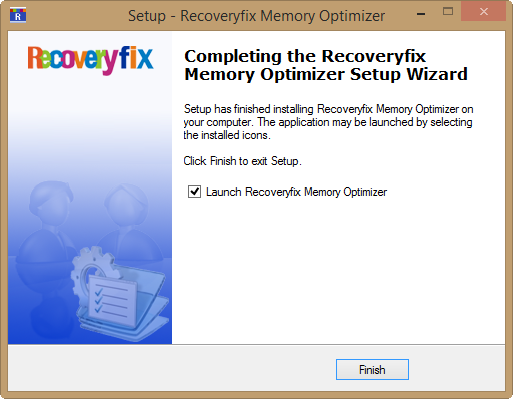 Yes, the Recoveryfix Memory Optimizer software has the provision of configuring the settings for automatic memory optimization. Just click the Settings tab, and then check mark the Automatically optimize memory and increase system performance option.